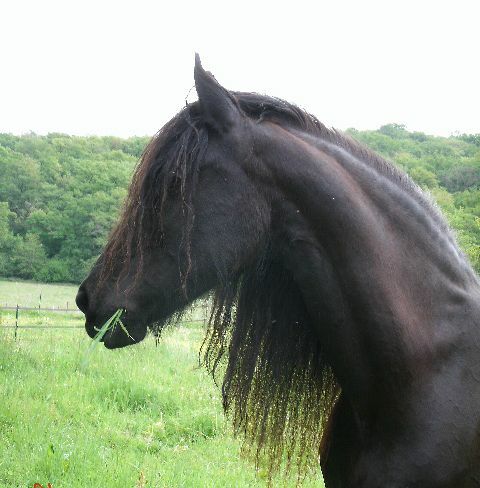 Belle de la Babinière is a pure-bred Friesian mare and the undisputed leader of our herd. 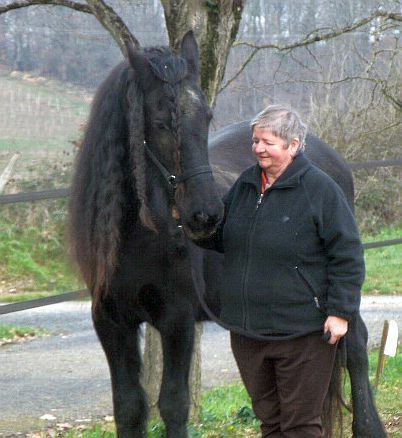 She is now in her 16th year and the mother of Aurore d’Alegria, one of our other Friesian mares. 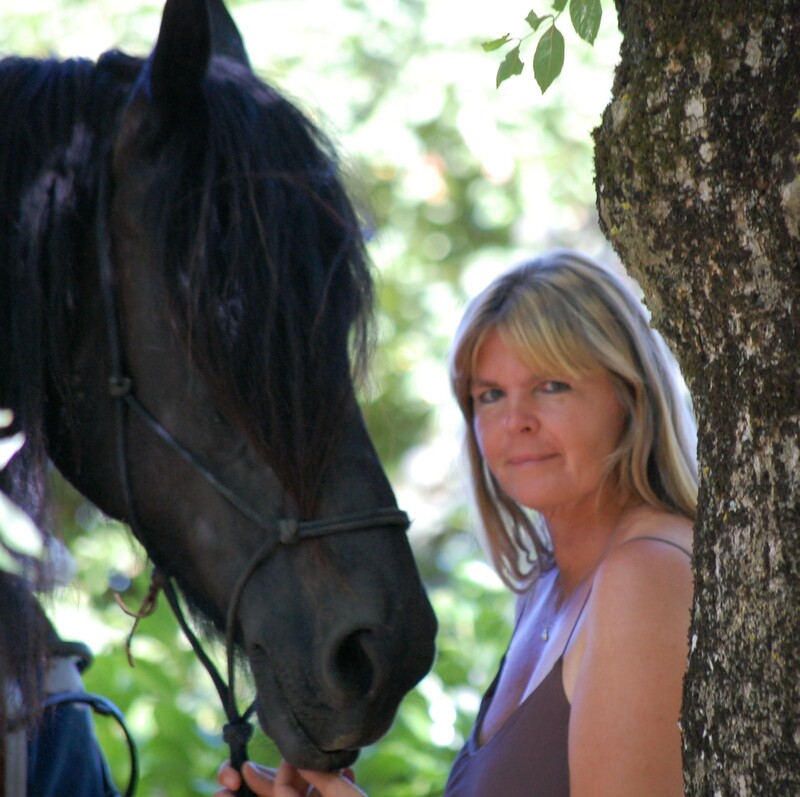 Belle has been working with me as my equine-assisted therapy assistant for many years now – 10 years, to be precise. She takes her responsibilities very seriously. She approaches her work in the same gentle but firm way as she looks after the well-being of each member of her herd. 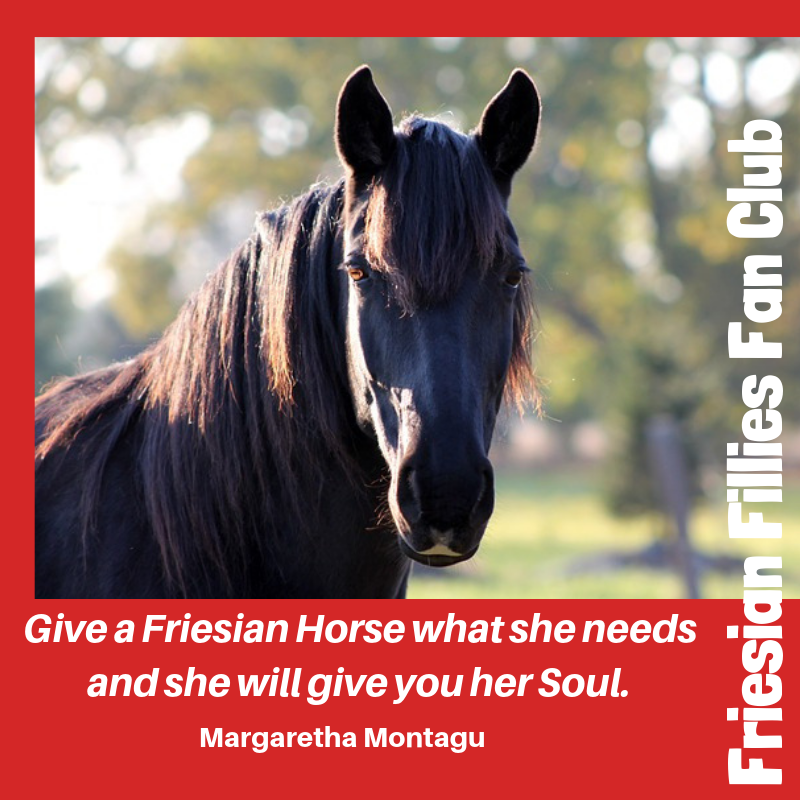 Friesian horses are some of the most beautiful horses that walk the earth today and Belle is probably one of the most beautiful representatives of this breed. She is well aware of her exceptional beauty. 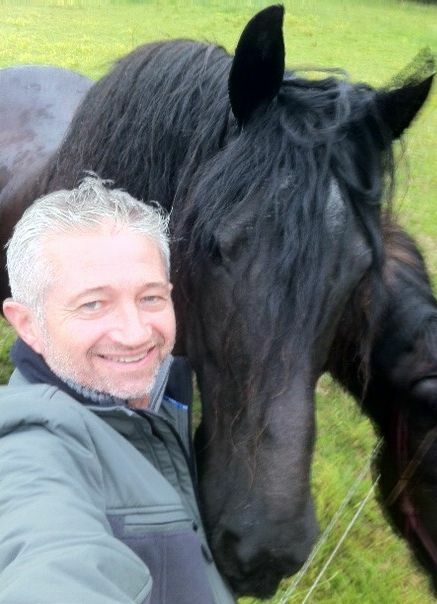 She is graceful and elegant and when she thunders across the meadow towards me, I always hear the introductory music to the Black Beauty TV series in my head. Belle loves appearing in public and adores all the admiring glances and shy caresses that come her way. Although she is huge, very few people can resist the urge to touch her and despite being in awe of this magnificent creature, they are irresistibly drawn to her. Belle is equally patient with everyone. 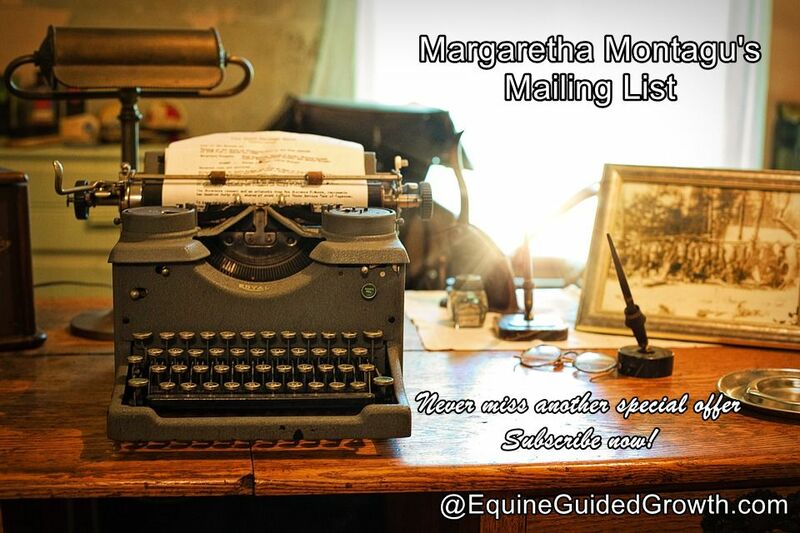 She came to us as a broodmare failure, her breeder could not get her in foal, no matter what he tried. In the first two years with us she was content enough, but as she saw our other mares become pregnant and have foals one after the other, having one of her own became an obsession. It still took us 4 years to get her in foal. Aurore was finally born 6 years ago, and Belle has not let her out of her sight since. I am convinced the pain and longing and many disappointments Belle has had to live through while attempting to conceive has made her a more successful therapist. She now understands people’s pain better and has more insight into human frustration and suffering. Many people who come to our farm on retreat form a lasting bond with her and come back year after year to visit and share their lives with her. Belle has an excellent memory: when any of her friends arrive, no matter after how long an absence, she is at the gate in a flash, whinnying a greeting and demanding a caress. No one that has ever crossed Belle’s path can ever forget her either. 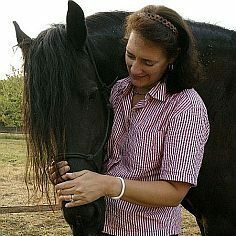 If you are interested in meeting Belle in person, why not join us for an Equine-guided Personal Empowerment Workshop? To inquire about availability or to make a reservation, contact us on welcome2gascony@gmail.com or use the form at the bottom of this page. In the meantime, would you like to escape on a virtual visit to the sun-blessed south of France for 10 magical minutes where you can quickly recharge your batteries and come back bursting with supreme self-confidence? CLICK HERE to find out more or subscribe at the top right of this page.